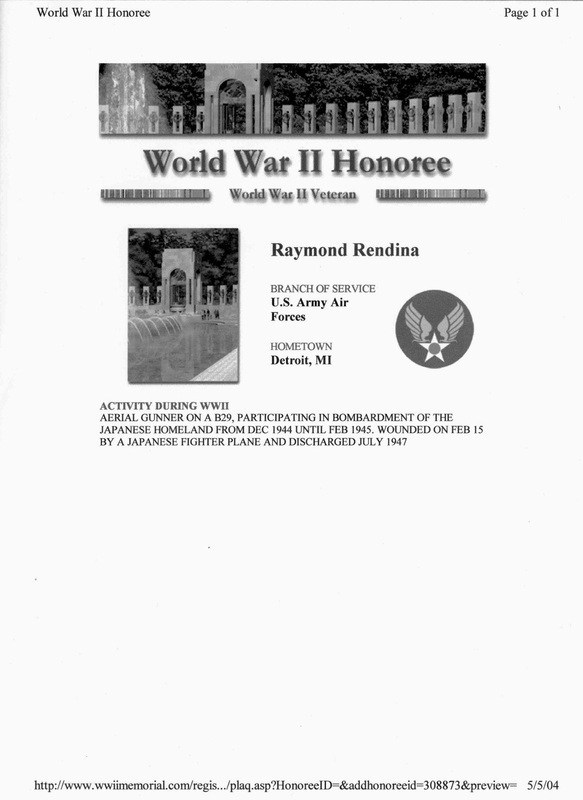 Romeo "Raymond" Rendina of Z-6, "Draggin Lady"
(Sgt. Romeo "Raymond" Rendina, tail gunner on the secondary crew of Z Square 6, "Draggin Lady." Romeo "Raymond" Rendina graduated from high school in June of 1943, one month before his 18th birthday. baseball, but by that time he had already received his military draft notice. Ray entered the service in November of 1943 and attended Basic Training at Jefferson Barracks in St. Louis. At the military induction center, he took and passed the Air Corp examination. through out the country. Men who had transferred in were reassigned to their original units, and many inductees like Raymond were assigned to Gunnery School at Tyndall Field, Florida. He was transferred to gunnery school in June, 1944 and his training at Tyndall lasted six weeks. After Gunnery School in late July or early August of 1944, Raymond reported to Kearney Field in Nebraska where he became one of the original members of the Robert Engle crew. He recalls only being at Kearney for about one week before he and the others boarded a train headed for Clovis, New Mexico. Arriving in Clovis in August, Raymond believes he saw his first B-29 up close and personal for the first time. From August through November, this crew lived and trained together to become a cohesive unit good enough to fly the most sophisticated bomber in the world. They were also informed that they were to be a "replacement crew," but Raymond said he didn't understand what that meant until later. Upon completion of their duties at Clovis in late November 1944, they were now considered a competent flight crew. Aircraft #42-63475. Raymond said they had to stand guard-duty to protect their new airplane, but he didn't mind. He also said they found a note from one of the girls at the plant assembly line attached to the steering wheel of the pilot wishing them "good luck." Raymond said one of his biggest disappointments was arriving in Saipan and learning their brand new airplane was being taken away from them and assigned elsewhere. Aircraft #42-63475 was assigned to the 498th Bomb Wing and designated as T Square 51. Named the "Houston Honey", it would survive the war. He said they flew to Mather Field, Sacramento, then on to Hawaii, Johnson Island and finally Saipan. He couldn't remember exact dates, but believes they arrived in Hawaii around the 7th or 8th of December, 1944.
in one of the fuel tanks that had to be removed. He loved Mather Field. He said the crew thought they must have been eating in the Officer's Mess because the food was so good, and they had white table linen and very nice silverware. The accommodations were excellent as was the PX. On the flight into Saipan from Johnson Island, he did say they had some excitement. The crew heard a loud "bang" and discovered that a cover on one of the top turrets had blown off. It scared the heck out of them, but they made it into Saipan without any further consequences. 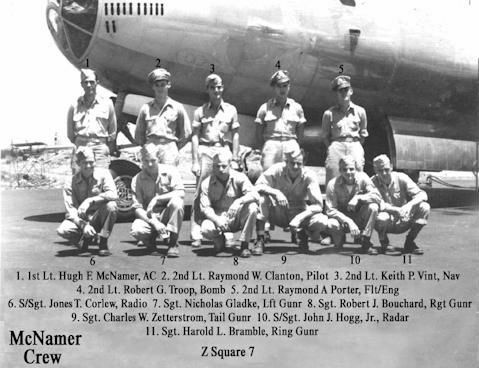 Ray stated that once they settled in on Saipan, he didn't realize that they shared a B-29 with another crew. That would be the original crew of the Z Square 6 now commanded by Lt. Patrick Calhoun. Ray was originally trained as the right gunner, but could also function as the CFC gunner. This was true on many crews as the CFC gunner often traded positions with the right gunner. He said he ended up as tail gunner on his crew after their first mission over Japan, because of a decision made by his A/C, Robert Engle. Evidently after that first mission, tail gunner Nicolas Gladke refused to fly in that position, so Lt. Engle had Raymond and Gladke switch positions. As tail gunner, Raymond manned a 20mm cannon and two 50 caliber machine guns. Awesome firepower. He said the 20mm cannon often times jammed, but they were a great deterrent to scare off Japanese fighter planes, even if they couldn't fire. He knew of a couple of tail gunners who even put red lights on them to bring them to the Japanese pilot's attention. Jim Bowman knows of an instance in the 58th, where the tail-gunner painted a broom stick black and stuck it out the back as if it were a 20mm cannon. On one mission, Ray said a Japanese fighter was inverted and came within 50 yards of him and he was so nervous he began firing and kept on firing. He said he could see his shells hitting the fighter which finally nosed over, but he doesn't know if it crashed or not. What he does know is that he did not follow the assigned protocol to fire short bursts, then let the barrel cool before firing again. He said he was too excited to remember his training and just kept firing. Ray and I discussed the issue of pressurization and oxygen use while on bombing runs, and he said they always went on oxygen. He was fairly certain they also depressurized over the target, in case the thin fuselage suffered a puncture from flak, enemy fighter cannon or machine gun bullets, or even a part flying off of their own airplane. Ray was seriously wounded on a flight over Nagoya when 20mm cannon shells from a Japanese fighter exploded in his tail gunners compartment. All the bones in his right wrist were crushed and he had other injuries. His flak-jacket was literally destroyed, and due to the explosion and loss of his oxygen mask he lost consciousness. Only the quick thinking action by Radar Operator Lester Johnson and A/C Robert Engle saved his life. He was injured on 15 February 1945, and spent the next two years in military hospitals before his discharge in 1947. Raymond was to stay in touch with Left Gunner Walter Pudlo after the war. He said was Walter was a great guy and one who volunteered to fly with other crews to get his missions in as quickly as possible and go home. He said the men on his crew respected Pilots Robert Engle and Glenn Pavey who were older, and he believes were regular Army. Ray's family was well represented in the Army or Air Corp. during WWII. His brother Leo was a tail-gunner on B-17s who flew 25 missions over Germany with the 8th Air Force. His brother Chester was a B-17 ground crew member with the 8th Air Force, who was stationed on the same base with Leo in England. Ray says he thinks his brother Sam had it the worst. Sam served with Patton's 3rd Army Tank Corp. through out the war and during their march across Europe and into Germany. Thankfully, all four boys survived the war. After his discharge from the Army in 1947, Ray worked as a tool and dye maker in Detroit. In 1952, he headed west with a job offer from Hughes Aircraft in Riverside, California. He then progressed to a better job at the San Diego Naval Air Station over-hauling airplanes and tooling new parts. He was promoted to the Atlas Missile Program as a manufacturing engineer. He ended his career in the Turbine Engine Program for the Caterpillar Company. It has been a pleasure to contact Raymond and listen to his stories, and I hope we continue our friendship into the future. CREW MISSIONS: Crew broken up after crash of "Draggin Lady" 23 Feb 45, killing both pilots. PILOT/AC - 1/LT. ROBERT E. ENGLE, KIA - 23 Feb 45. CO-PILOT - 2/LT. GLENN E.PAVEY, KIA - 23 Feb 45. BOMBADIER - 1/LT. 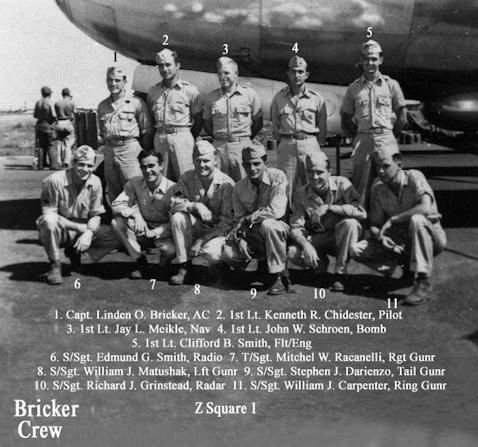 JOHN W. SCHROEN - Assigned Bricker crew. FLT. ENGINEER - M/SGT. DOOLEY H. ROGERS-Seriously injured 23 Feb 45. RADIO OPERATOR - S/SGT. JOHN R. LIPPA-Seriously injured 23 Feb 45. RING GUNNER - S/SGT. ROMEO R. RENDINA-Serious injured 15 Feb 45. RIGHT GUNNER - S/SGT. FRANCIS F. MELBER-Assigned Pearson crew. RADAR OPERATOR - CPL. LESTER E. JOHNSTON-No further information. 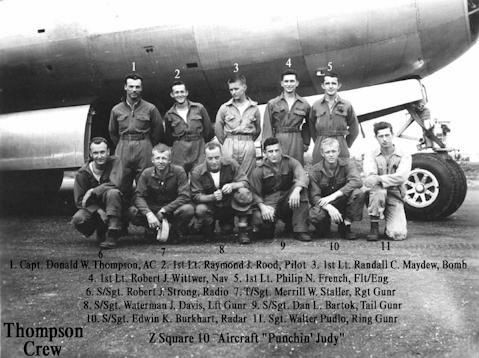 *This crew replaced that of Joseph Irvin which was the first crew lost in the 500th Bomb Group on 27 Nov 44. Irvin and his men were the original crew #105. A WSM (weather strike mission) was his first to Japan and would be to TOKYO. He said this was "kind of a nuisance raid to keep the Japanese up all night." But their bomb rack malfunctioned and the bombs did not drop, so they had to make two passes over the target. He stated that "finally Lt. Engle crawled into the bomb bay of Z Square 6 with a screw driver to jettison the bombs." He also mentioned that he had been trained as a CFC and side gunner, but because of crew changes after this mission he only flew as the tail gunner. Although only 19 years old, he said he didn't care because he felt "indestructible." harmlessly into the ocean. At about 1500 feet, full control of the airplane was regained as they flew towards Saipan. A P-61 Night-fighter picked them up and escorted them in to Isley Field, as their engines cut-out and their hydraulics failed. Raymond and his crew took off from Saipan on a daylight, high-altitude mission to NAGOYA. They carried a bomb load mix of high explosive and incendiary bombs. ***They had to abort this mission due to a fuel transfer system failure and returned to base. Completed the mission to OTA on Z Square 6. While Raymond Rendina and the Engle crew flew the Z Square 6, "Draggin Lady", the Calhoun crew flew the Z Square 7, "Hell's Belle" on this mission. Flying at 29,000 feet, the planes would bomb the Nakajima Aircraft factory near OTA, with 10x500 lb. GP bombs, and 2x500 lb. incendiary bombs. The mission over the target was mostly uneventful except for the Tull McGuire crew and the Z Square 13, which was attacked and severely damaged by a Tony fighter. A gunner on the Z Square 6 saw something fly off of McGuire's right wing, and with smoke coming from the number 3 engine, the plane turned around and headed for the coast. Z Square 13 and its crew were never seen again and were presumed to have been lost at sea. A high altitude precision bombing mission at 26,000 feet to bomb the Mitsubishi Aircraft Engine plant in NAGOYA. After the bomb run, Raymond said the Z Square 6 was attacked by Japanese fighters that "came out of nowhere!" He added that he "was hit by 20mm cannon shells which hit the ship and exploded, showering me with shrapnel and destroying my flak-vest." He said he didn't remember getting hit and didn't feel much when he came to. According to the 881st Squadron report: Oscar and Irving's attacked the plane and damaged the horizontal stabilizer and the tail gunners compartment. The report also states "Sgt Rendina's life was saved by prompt first aid given by radar operator, Sgt. Lester Thomas, and A/C Lt. Robert Engle." 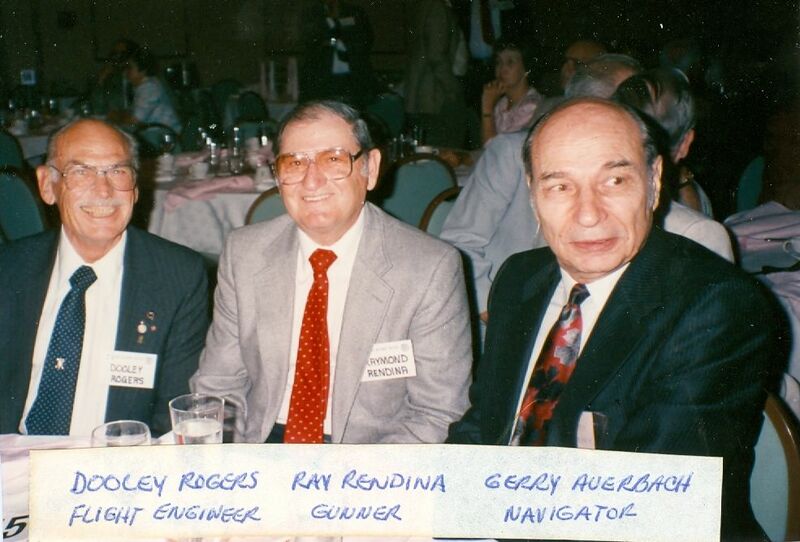 Sadly, A/C Engle and Co-Pilot Glenn Pavey were killed a few days later during a slow-timing mission when the Z Square 6, "Draggin Lady", crashed in the ocean off Saipan. Raymond said they found Lt. Engle's crucifex attached to his steering yoke in the plane. Sgt. Rendina would never fly another mission due to the seriousness of his injuries. All of the bones in his wrist were pulzerized from the impact of the 20mm cannon shell. He was shipped to Hawaii before the end of February, 1945, and spent the next two years in Army Hospitals undergoing skin and bone grafts, and the permanent fusion of his wrist. He was finally discharged from the Army in 1947.
confirmation by an Army Chaplain. Since then, my complete name has been Romeo Raymond Rendina". 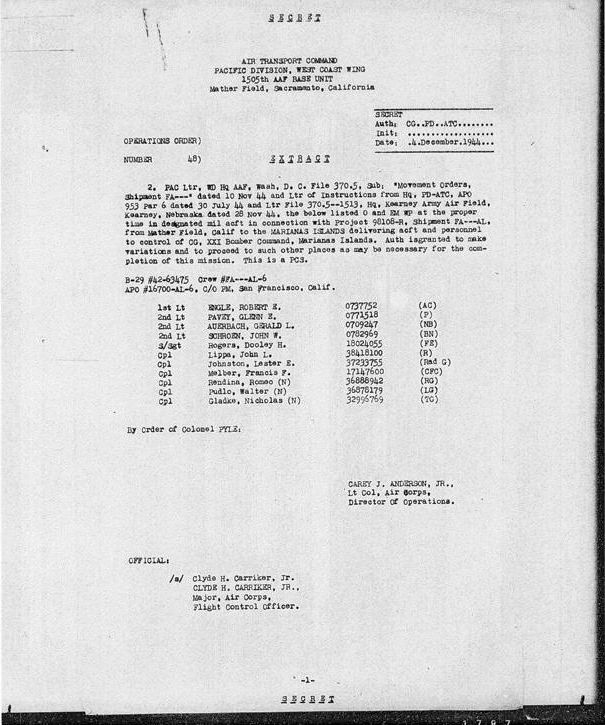 Movement Orders for the Engle replacement crew directing them to proceed to Saipan. 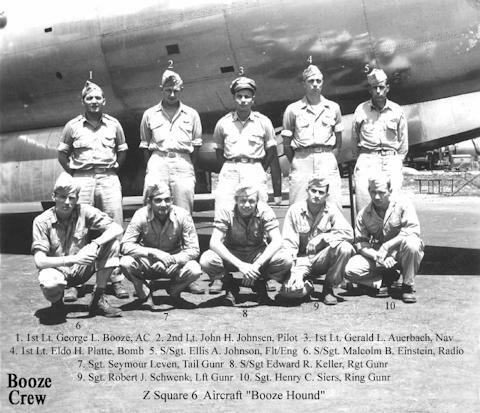 The Engle crew would replace the Joe Irvin crew, Z Square 2, that was lost at sea after the 27 November 1944 mission. Radio Operator Charles Maples of the Z Square 6 was the last person to have contact with the Irvin crew, as documented elsewhere on this site. This picture was taken just before take off for the 23 January 1945 mission. Raymond Rendina is in the top row far right. Lts. Engle & Pavey in bottom row, 2nd and 3rd from left. Identified in the photograph: Rendina, back row-far right. Gladke, back row-2nd from the right. Pudlo, back row-3rd from the right. Engle, front row-2nd from the left. Pavey, front row-3rd from the left. Raymond Rendina and the Engle crew in front of the "Draggin Lady" prior to the mission to Nagoya, 23 January 1945. It was a high-altitude, daylight mission and the aircraft carried a mix of high explosive and incendiary bombs. Unfortunately, the "Draggin Lady" and her crew had to abort the mission due to a fuel-transfer system failure. Bombadier John W. Schroen, back row 2nd from right, #4. Assigned to the Bricker crew after Lts. Engle and Pavey were KIA in the crash of the "Draggin Lady." Remaining crew members were assigned to other aircraft.